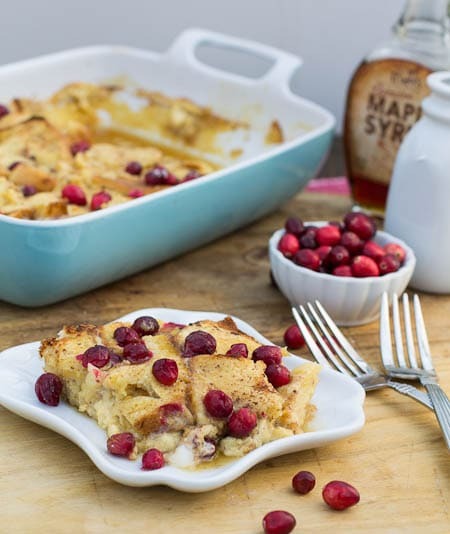 Cranberries and eggnog are two of my favorite ingredients to cook with this time of year. I love the flavor of eggnog and cranberries just look so festive. My husband usually ends up taking lots of vacation times this time at the end of the year. I love just staying home, sleeping in, and having an easy, delicious breakfast that can be eaten at everyone’s leisure. It’s the one time of year we seem to have time for enjoying breakfast day after day. French Toast is one of my favorite breakfast foods and I especially love it in this overnight casserole. It is really more like bread pudding. It’s wonderfully moist and a little custardy. Because it can be prepared the night before and popped in the oven in the morning, it makes a wonderful breakfast for Christmas morning. 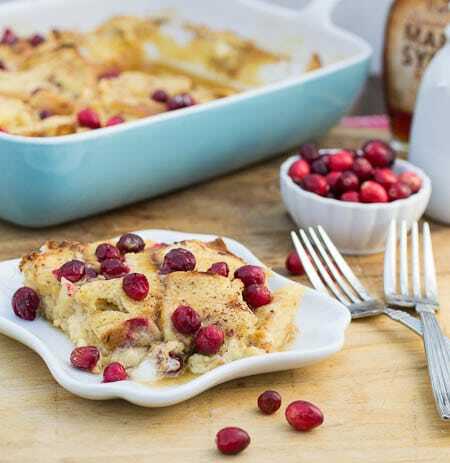 We have Monkey Bread each Christmas morning, but this sweet and a little tart Eggnog French Toast Bake may have to start making an appearance. It’s absolutely delicious! 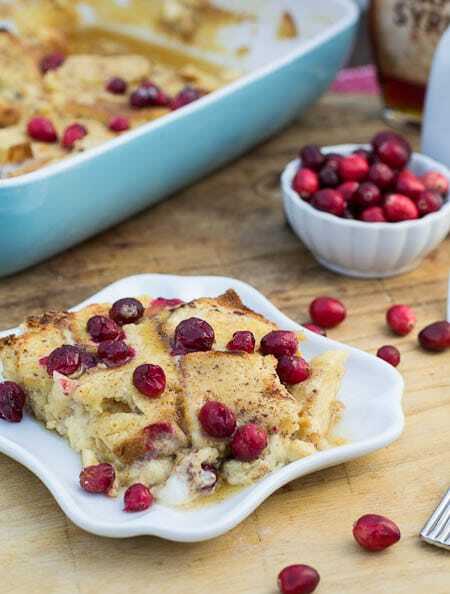 An easy overnight French toast flavored with eggnog and fresh cranberries. Heat brown sugar, butter, and corn syrup in small saucepan over medium heat. Stir occasionally and remove from heat when mixture begins to boil. Pour brown sugar mixture into prepared pan and place bread pieces on top. In a medium bowl whisk eggs and eggnog together. Mix in cinnamon, nutmeg, and vanilla extract. Pour egg mixture over bread. Cover pan with aluminum foil and refrigerate at least 6 hours or overnight. Remove from refrigerator and heat oven to 375 degrees. Remove foil and sprinkle cranberries on top. Place in oven and bake 35-40 minutes. Sprinkle with powdered sugar and serve with maple syrup. 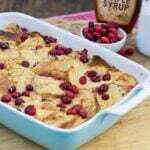 This entry was posted in Breakfast and tagged Cranberry, eggnog, french toast. Bookmark the permalink. Is there an acceptable substitute for corn syrup? You can try using honey instead. Thank you so much Kelly! You’re so sweet! Hope you and your family had a wonderful Christmas! Oh, I would love to wake up to this tomorrow, but I had no time to prep. Maybe new years! This just looks like the perfect holiday breakfast! These are perfect on Christmas morning. 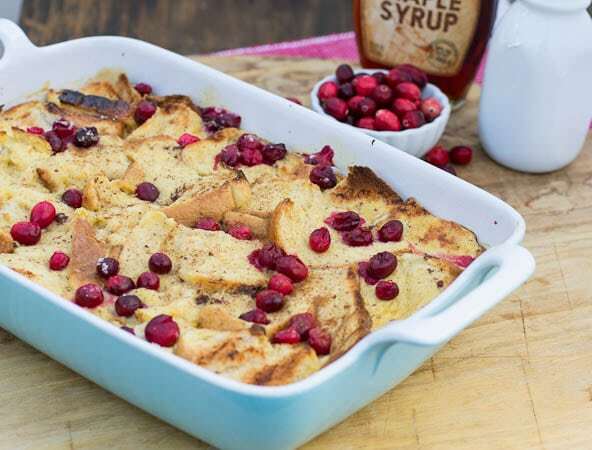 Eggnog french toast bake –yum! 🙂 Merry Christmas Christin! And have a fabulous week my friend. This french toast looks very delicious! 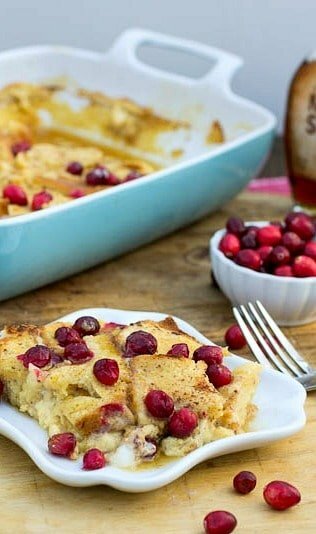 I never tried it with cranberries , thanks for sharing! This is beautiful for Christmas morning! I love it! I hope you have a Merry Christmas! I love overnight breakfast dishes like this! You do all the work beforehand and then can relax that morning! The combination of eggnog and cranberries sounds amazing! Merry Christmas!! This would be PERFECT on Christmas morning! It looks too delicious! Thank you for sharing. I hope you and yours have a beautiful Christmas! This is the perfect breakfast for Christmas morning! With all that you and your family have been through this year, I hope that you can relax a little and have a wonderful holiday, Christin! This would be great with challah! What a great idea to use eggnog as a base for french toast. I love it!